The family and I got to spend a couple of hours at one of our favourite places again today, Roast Coffeehouse. It's been too long since we've been! We noticed some new sodas that we just had to try, Q Drinks. 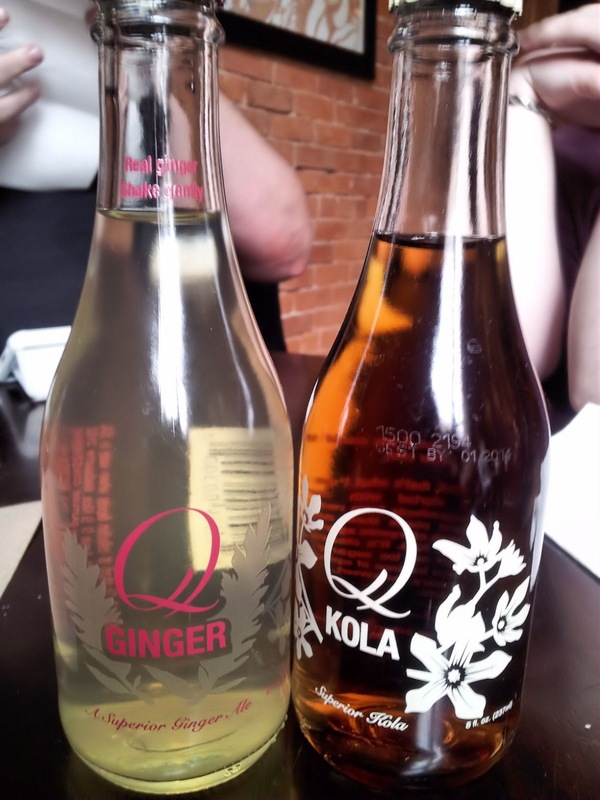 There were 4 flavours, but we chose two; Kola - Superior Kola, the label tells us, and Ginger - A Superior Ginger Ale. They come in pretty little bottles, with only 237 ml/8 fl oz rather than the 355 ml/12 fl oz you'd get from a canned drink, and quite a bit more expensive. I don't remember the price per bottle, but after enviro fees and GST, it came out to just over $4 a bottle. Aesthetic appeal was definitely something the makers paid attention to. 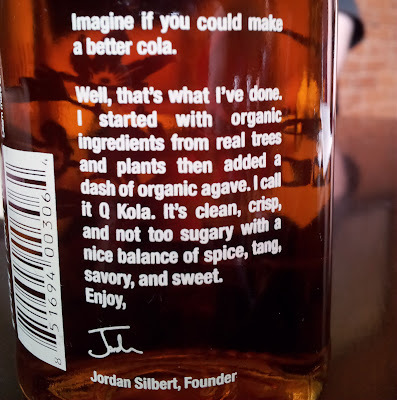 The Kola bottle even went the extra mile, with a personal message from the company founder. "Real trees and plants," huh. As opposed to fake ones? Looking at the website, one of the things that had me rolling my eyes a bit was their going on about using organic agave instead of "high fructose corn syrup and sugar." It's always disappointing to me when I see companies playing on people's fears and health fads of the day. Sugar is sugar is sugar, regardless of the source. Still, I'm not a fan of super-sugary anything, so the promise of these being not too sweet was encouraging. So were the ingredient lists. The Kola lists carbonated water, organic agave, phosphoric acid, extracts of cinnamon, clove, coriander, kola nut, lemon, lime, orange and nutmeg. Caramel. Caffeine. The Ginger Ale lists Carbonated Water, organic agave, ginger extract, extracts of lemon juice, coriander, cardamom, capsicum, orange peel, rose oil. Sounds really interesting! The Ginger Ale bottle did not include a pretentious little message from the founder. So, did the sodas live up to their hype? The Ginger Ale was not as overwhelmingly ginger flavoured, nor as ... chunky... as some sodas we've tried. Unfortunately, it didn't really have much else to make up for it. We could taste a light phosphoric acid bite and a light ginger flavour, but there really wasn't much of anything else to make it stand out. It was rather pleasant and light (this from someone who does not actually like ginger ale, nor almost any of the clear sodas). It was nice. Other family members who actually do like ginger ale didn't find it particularly appealing. Nice to try, but not enough to want to buy it again. It was much the same with the Kola. Lightly flavoured with the light phosphoric acid bite, it was happily as not-sweet as promised, but... it was really rather boring. I was hoping to taste more of the spices listed in the ingredients, and I really didn't. They were both good, but not great. 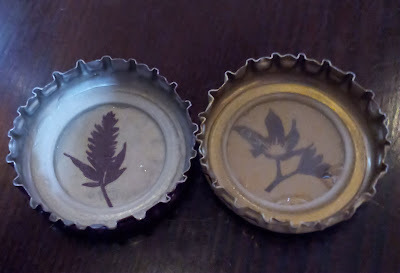 I'm actually more impressed with the bottle design than I am with what was in them. When it comes down to it, if I'm going to spend more money to get a more traditional sodas, I'll stick with Boylan for cola and Reed's for ginger. Brewer's ADD, Innis & Gunn Winter Treacle, Skullsplitter. So the other day I sat down with three beers, my little sister, and the third season of Avatar: The Last Airbender. Because you're not the boss of me. The first beer is Brewer's ADD, with an appropriately spastic label design. It's aggressive, with a good bite. Not much subtlety, but I like it. Second up is Innis & Gunn's Winter Treacle Porter. Now, Innis & Gunn is one of my favourite brewers, hands down. My favourite of theirs so far has been the Irish Whiskey finish, but this one might be right up there. It's pleasantly bitter, like black coffee, but with a strong fruity undertone. I recommend it. The suprise winner for the night, though, was the Skullsplitter. Which I admit that I bought because it's called Skullsplitter. The best way I can describe it reminded me of a good, strong cheese. Not in flavour (I'm not sure even I'd go for that more than once), but in the way the taste is delayed. When it first hits your tongue, it's unremarkable, and then BAM! Flavour! Flavour everywhere! It's bombastic is what I'm saying, and I plan to pick it up again. "You gotta try this Ethiopian beer I found!" All right, what's it called? "I don't know, it's in Ethiopian." So I really hope I titled this post right. First off; this label is really nice. I love the colours and the adorable little St. George, and it was certainly easy to pick off the shelf. Unfortunately, that's about all that distinguishes it. It's a light beer with that typical back-of-the-throat apple-juicy acidity. I can drink it, but I wouldn't go out of my way to buy it again. Guess what image I didn't know I'd be using again so soon. Recently, Spin and I got together with a group of friends at La Shish Taouk. I was rather glad that the group met here, as it's a place that caught my attention some time ago, and I'd been interested in checking it out. I'd never had Lebanese food before, and I was curious. While perusing the menu, I noticed something in the drinks list I'd never heard of before; Ayran. So I asked the waitress about it, and she told me it was a fermented yogurt drink with salt. What the heck, I decided. I'll try that! I've had fermented dairy drinks before and liked it. I've looked up the website since then, and have learned that Ayran is "the healthiest soft drink in the World !" Soft drink is not how I would have described it. The ingredients list is water, yogurt, salt, citric acid and what I think was a preservative, but I can't remember the name of. It looks pretty much like a glass of milk, only slightly thicker. As for the taste. It kinda tasted like the liquid in commercial cottage cheese, plus salt. According to the label, the drink is meant to be served chilled. I'm not a fast drinker, so it was room temperature by the time I finished it. The flavour becomes more intense as it warms up. Spin gave it a try and promptly rejected it. She didn't hate it or anything, but definitely didn't like it. Too salty, for starters. It was definitely an interesting drink, and I don't regret ordering it, but it's not something I'd order again. I could get used to the flavour, but not the saltiness. I suppose if I made it at home, I could control for the salt easily enough - basic recipes I've found are equal parts water and yogurt blended with salt to taste, so it'd be simple enough to make. Some recipes include cumin or mint, which sound interesting, but neither are flavours I associate with salt. 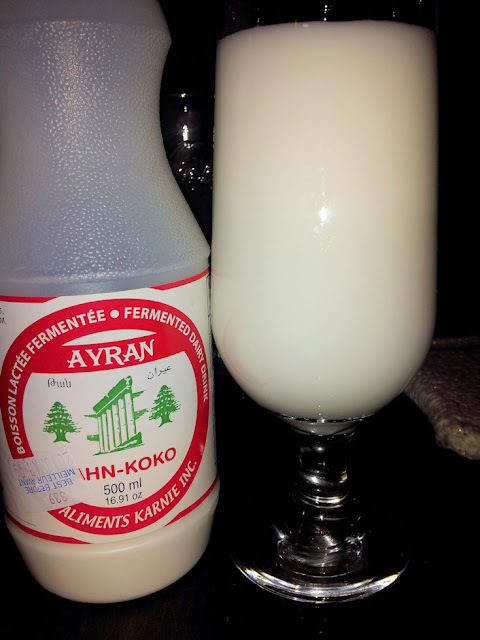 Ayran, from what I've read, is incredibly popular in Turkey, but when it comes to fermented dairy, I much prefer kefir. THIS BEER TASTES EXACTLY LIKE A BAR OF 80% COCOA CHOCOLATE. Seriously, though. 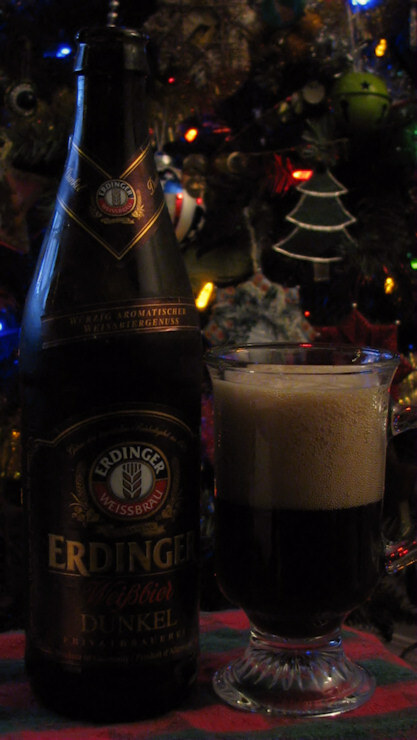 I saved this for the last of my Christmas gift beer reviews because I figured it would, at least, be the most interesting of the bunch. I was not wrong! 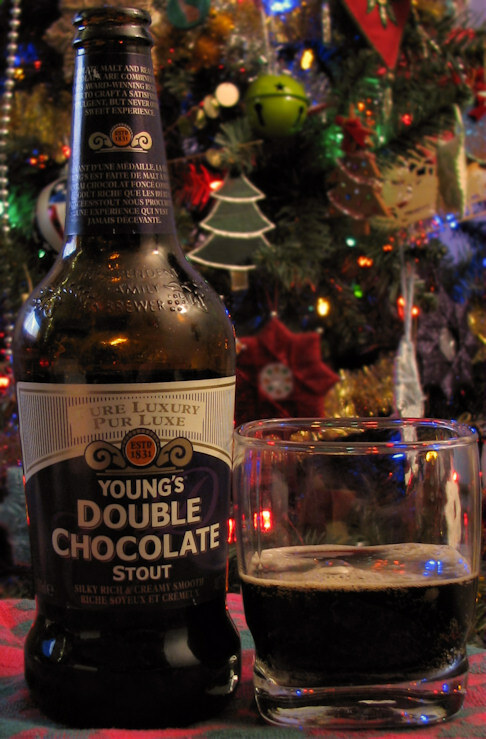 Young's Double Chocolate Stout, unlike our last encounter with a "chocolate" "stout", really delivers on its description. "Silky rich and creamy smooth" "never overly sweet". It is definitely on the dark, bitter side. I mean, even I can taste it. That doesn't keep it from being added to my favourites list, and if you're the type to like such things, it should probably go on yours. The pale ales and ciders out of the way, it's time to get to the darker portions of my Christmas gift beers! I offered my mother the first taste of this one. I couldn't see her face, but her shoulders hunched and her neck tucked in like those of a disgruntled pigeon. So maybe I'm just happy to finally be drinking something with discernible hops, but I like this! It's clean, smooth and pleasant with a slightly creamy aftertaste and the tiiiniest hint of malt. The alcohol content is a modest 5.3% and, when not smothered by a prodigious mattress of foam (drink it from the bottle, kids. ), it goes down nicely. I wouldn't rank it among my favourite (hey, I should write about those. ), but I might order it for a lunch out. Overall, I feel I must bestow upon this beer the highest award in ambiguousness I can provide. A triple-review today! 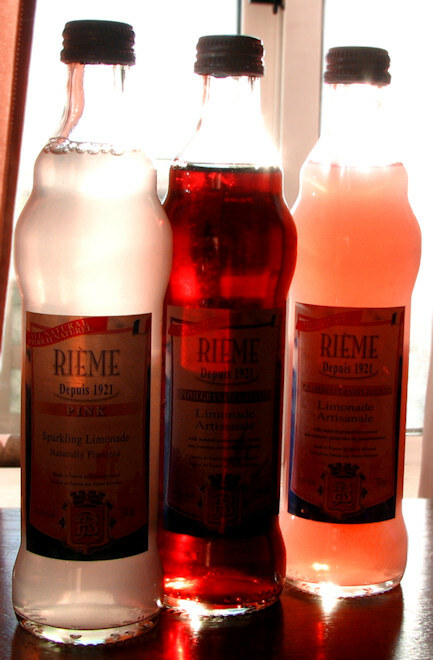 My mother brought home this lovely trio from a trip to our local Italian (and, by extension, Most-of-European) Grocery a while back. The bottles are dainty and pretty, the label design is uninspiring but not off-putting. Our flavours for today are Pomegranate, Grapefruit and... uh, "Pink". The Pomegranate one smells like candy and has a light flavour, but isn't overly sweet. It's clean and refreshing. The Grapefruit one is a bit more carbonated than the other two and, again, the fruit flavour is understated. The Pink one is actually white, and I think it's just plain lemonade flavoured. Still, very nice. There were other flavours available, including "traditional" which was clear as water. Each cost about a dollar and a quarter (Canadian) apiece, plus enviro fees. All the flavours are united by a certain unobtrusiveness. They're not too acidic, not too sweet, not too carbonated. Pleasant and thirst-quenching. I think the Pomegranate and Pink ones are more to my liking, but I'd recommend giving any of them a try.